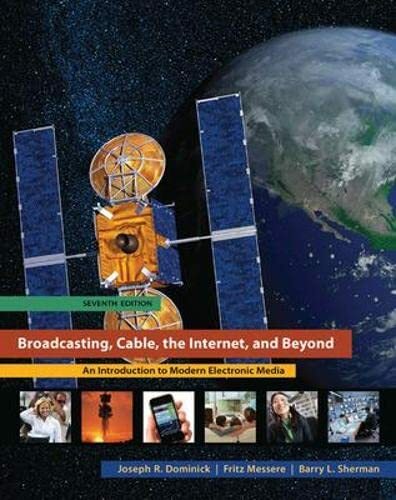 This survey of the field of modern electronic media includes the new technologies, regulations, programming, and competition that affect our world and the broadcasting industry. The text conveys the excitement of the industry in a highly accessible style that makes even the most difficult information understandable. Joseph R. Dominick received his undergraduate degree from the University of Illinois and his Ph.D. from Michigan State University in 1970. He taught for four years at Queens College of the City University of New York before coming to the College of Journalism and Mass Communication at the University of Georgia where, from 1980 to 1985, he served as head of the Radio-TV-Film Sequence. Dr. Dominick is the author of three books in addition to The Dynamics of Mass Communication and has published more than thirty articles in scholarly journals. From 1976 to 1980, Dr. Dominick served as editor of the Journal of Broadcasting. He has received research grants from the National Association of Broadcasters and from the American Broadcasting Company and has consulted for such organizations as the Robert Wood Johnson Foundation and the American Chemical Society. Dominick, Joseph R; Sherman, Barry L; Messere Professor, Fritz J.